When you think of Japanese food, sushi may be the first thing that comes to mind. But the world of Japanese street foods and bar snacks is just as eye-opening and tasty, while eschewing less accessible ingredients like bluefin. One of my favorite dishes is takoyaki, or octopus balls. These are typically cooked in massive hot plates at street stalls and festivals. In Japan, it’s not unusual to see just one chef deftly turning, cooking and serving dozens of takoyaki in a matter of minutes—the speed is truly remarkable! After watching these takoyaki masters at work, I began to wonder how I might replicate the dish at home. First, you start with a takoyaki pan. If you have gas burners, I recommend this reasonably priced cast iron takoyaki pan, which even comes with a smiling octopus at the top. There are also electric pans which you can use on any counter top, though they do take up a bit more storage space. 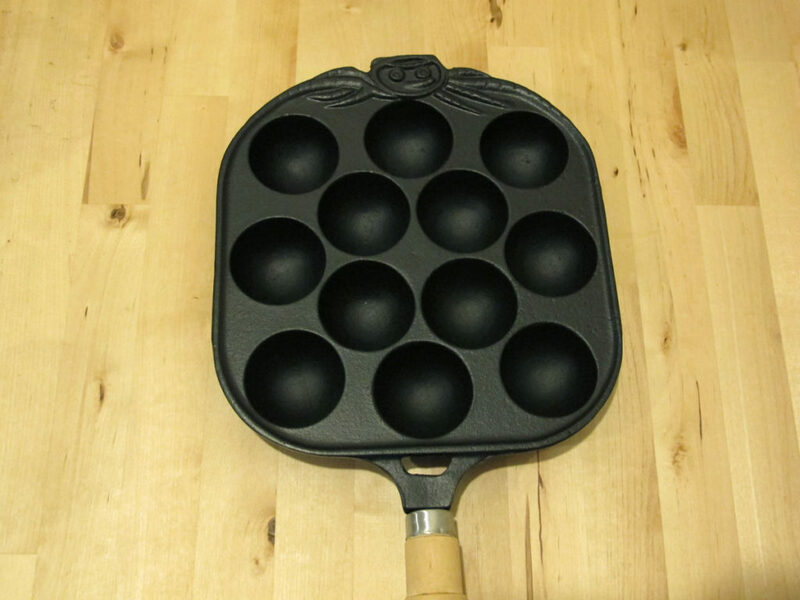 Also, if you are concerned about cluttering your kitchen with single-use kitchen items, just think of what else you could make in balls, like Danish aebleskiver (puffed pancakes) or donut holes! Having already tenderized and cooked an octopus, I simply diced an arm into pieces and prepared the batter. The batter is fairly simple, mostly flour, water and egg with some dashi powder (Japanese soup base made with dried fish flakes and seaweed). If you don’t have dashi, you can substitute some chicken bouillon powder. The batter should be thin, so don’t be concerned if it’s quite runny. A few more tips: be sure to generously oil the surface and holes of your takoyaki pan. You want to be able to flip the takoyaki balls easily, so this is important. Also, if you try to rotate your takoyaki balls and they seem sticky, they probably haven’t developed a firm crust yet. If you wait another minute or two, the takoyaki usually firms and becomes easier to rotate. Finally, if your takoyaki aren’t perfectly spherical or come out looking like Pac-Man, fret not. Once you douse the balls with sauce, seaweed and other garnishes, it will still be delicious and no one will be able to tell the difference anyway. *These ingredients can be purchased at Japanese groceries or a well-stocked Asian grocery. Combine the flour, cornstarch, eggs, water, dashi powder and soy sauce to make the batter. Whisk until large lumps have dissolved. The batter should be thin. Using a brush or paper towel, generously coat the surface and holes of the takoyaki pan with oil. When the pan is hot, fill each hole to the top with batter. Add a few pieces of octopus and some scallions to each hole. Let the takoyaki cook until the exterior has crisped and you can easily turn them using a sharp pick (I used a kebab skewer). Turn the takoyaki 90 degrees and pour more batter into the hole to round out the ball. Continue turning each takoyaki ball, adding more batter as needed to round out the balls. The final product should have a golden, crisp exterior while maintaining a slightly soft, jiggly center. If you are using a takoyaki pan over a gas burner, you may notice that the pan heats unevenly, with the balls on the edges cooking more slowly than the balls in the center. To distribute the heat more evenly, you can try setting the pan on a heat diffuser. 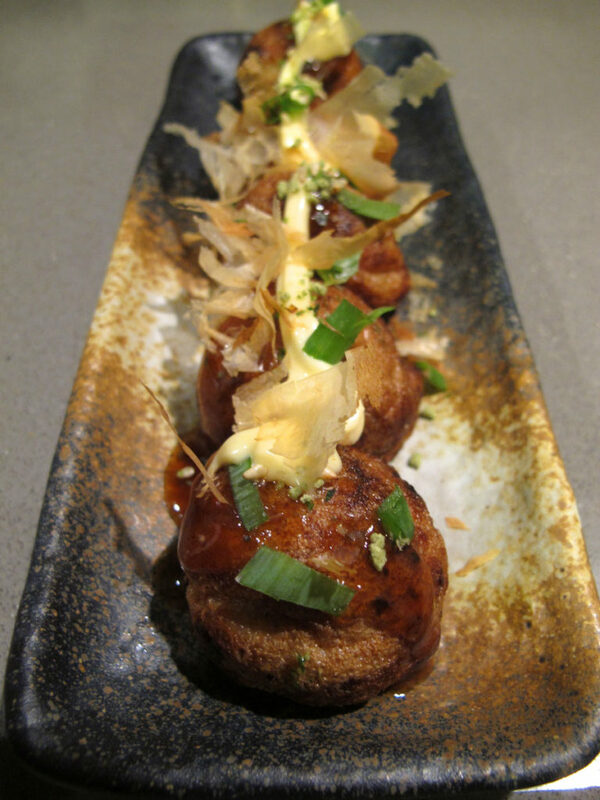 To dress the takoyaki, place them on a plate and drizzle the takoyaki sauce onto the balls. Add the kewpie mayo (you can get creative and do this in swirls, dollops, diagonal lines, etc), then scatter scallions, pickled garlic and seaweed on top. Finally, add some bonito flakes to the takoyaki. The steam and heat from the takoyaki will cause the lightweight bonito flakes to sway and flicker a bit. Don’t be alarmed at this movement; you must carry on with your mission to eat the takoyaki as quickly as possible before they cool.